Father, Husband, Engineer, Mentor, Climber, Friend, Geek, Dork and the somewhat recently added Wolf Den Leader of Cub Scout Pack 745 in Eastover, NC. With this hat comes training. Late last year I attended the best Leadership course I've been to. Wood Badge. Highly recommend it, but that isn't why I'm writing this. As part of this leadership training, and my general Ilk, I endevoured to find a way to incorporate STEM and the Engineering method into what is already a rich environment of scouting. I set one of my goals to put together an event highlighting the symbiosis. 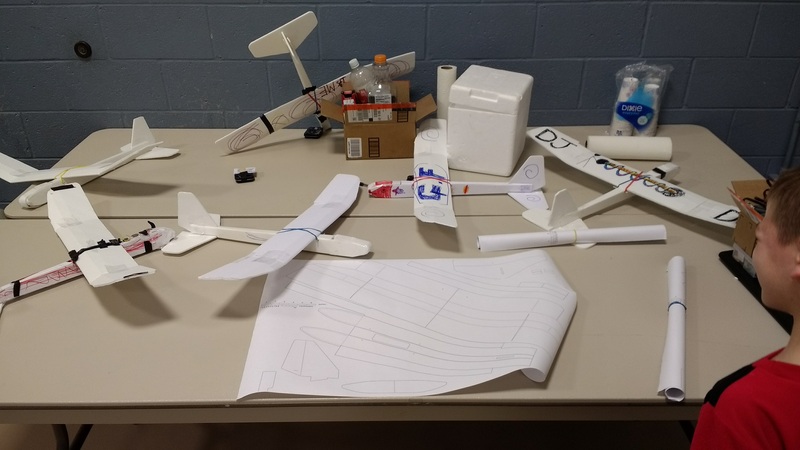 I was also becoming addicted to plane building, thanks to Flite Test, and I wanted to spread the word. And their and MESA RC's STEM guides inspired me to know the two would fit. So in the leaders meeting, months back, I mentioned my strong desire to do a STEM event day. The leaders agreed the ball was mine and the Camp-in event was the place. Our resident Chemist agreed to join me with a Demo as well. As I planned the event I use these forums to find out which plane I'd choose, and went with the Tiny Trainer. I had two criteria, I Had to be built with just tape and a scout is thrifty so LOW Budget. 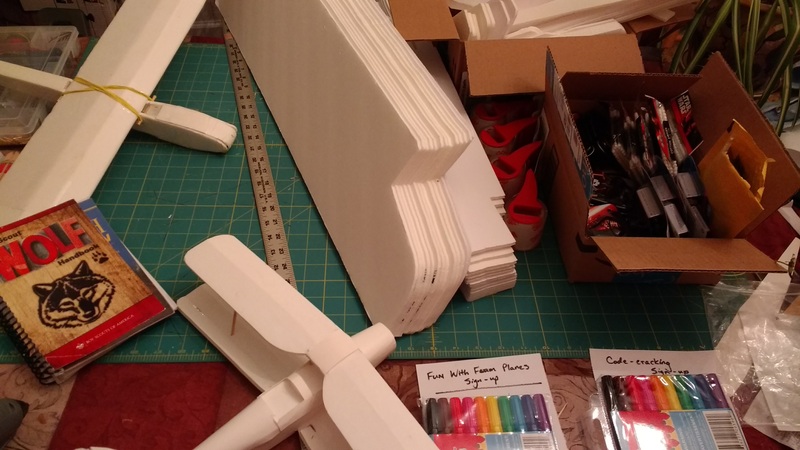 I was worried about building such a large plane with potentially little to no budget and while searching I found http://forum.flitetest.com/member.php?19748-SheppO&#8221;] SheppO's[/URL] reduced scale TinyTrainer. Same great plane on only 1 sheet. I chose this plane because we could use tape to put it together. as the the hot glue is a bit too dangerous, and I wanted the kids to be able to do it on their own. I just worried about how I would cut out so many planes without spending all my free time doing it. 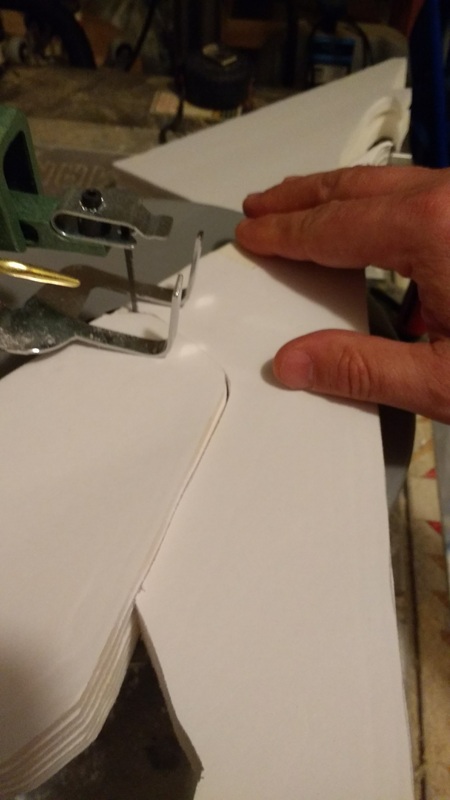 Then as a side note on NerdNic's Manic Micro Thread while discussing the Tiger MothThe-One-Who-Never-Crashes saved my hide and by asking if I had a Scroll Saw. Details on that here. I knew exactly what he meant. Instead of spending 40+min per plane to cut the shapes, I did 7 in the same time. So in 3 - 3 1/2 hrs I had all the pieces to 13 planes cut and ready! The Chemistry Demo was Amazing, With dry-ice how could you go wrong. Last was "Fun with Foam Flyers" as I called it. To get ready, I wanted to start by explaining the parts of the plane they were buildling and how it work and is controlled. I put together this collection of informational images from the net here. View attachment 81960 Use or private use only please as I didn't pull the credits for these. Best used as a guide. Above, I'm using the guide and the example plane to go through the information packet. I then showed the plans. We talked about engineers and the plans and what they're for. I started with building the fuselage and added the doubler, pull the paper from the front nose and rolled the front around top. They taped around the nose to add strength to the likely impact spot. Then I had the boys take markers and make the plane their own. Coloring the Fuselage and wing. This turned out to be a great way for every boy to know which was theirs. Next was to build the wing. I took this time to talk about dihedral and why it's on the beginner planes. We didn't use a gauge and it was neat to see how different dihedral angles changed the flight. At this point the boys could see the plane coming together. Then we put the tails on. Inserted the skewers and attached the wings on. I had them start with 6-7 pennies rolled in tape, put in the nose and then stuffed with paper towel or plastic bag. Light and a decent space filler. 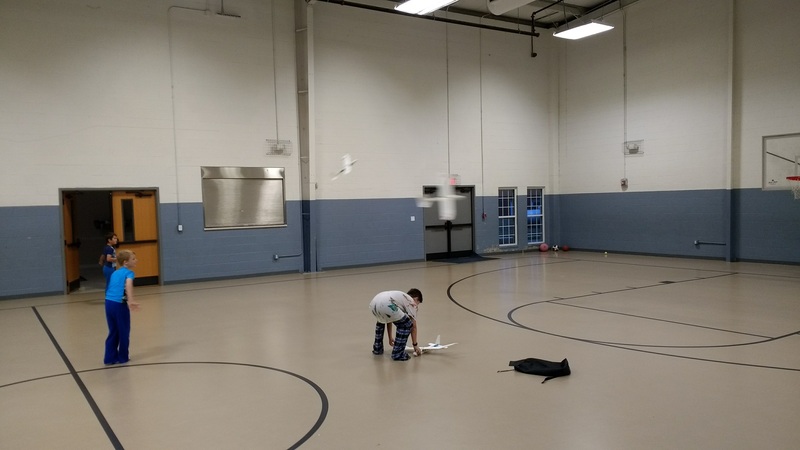 Before the weighting step, some boys took their planes and began throwing them. They did giant loops which really got the rest energized to finish. Some put the weights in and were excited to have a plane fly a long way and straight. They all flew relatively well. No one was disappointed. They were durable too. I brought some of my other FT planes for examples of other flying planes - The Bloody Baron(for decoration ideas), a busted FT Mini Arrow (to illustrate it's durability), and the nnTigerMoth (to show a bi-plane, and size differences). I also briefly talked about how they could take this further and make it an RC plane in the future. (A-pack). Recruit help with the 50% score cuts to save time. Tape the doublers before rolling the fuselage. 1 tape roll for every 3 kits-ish. Have a Catch Game or Target game ready ID'd in the beginning. Keep Other example non-chuck-gliders in an "Off Limits Zone"
During the overnight, beepers and Gliders were on the Quarantine Table - not to be touched till morning. 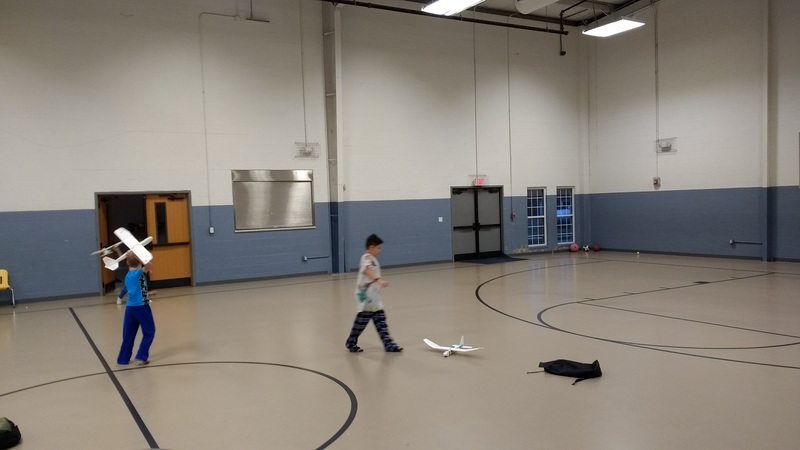 Thanks Flitetest for Inspiring the fun we all had this weekend and the community like The-One-Who-Never-Crashes, for the help encouragement and advice. This event was a BIG hit. I hope this helps the next person with their event. Feel free to PM me If you want more info. Congrats on a successful event! That looks like a ton of fun for everyone. Sounds like a wonderful program. 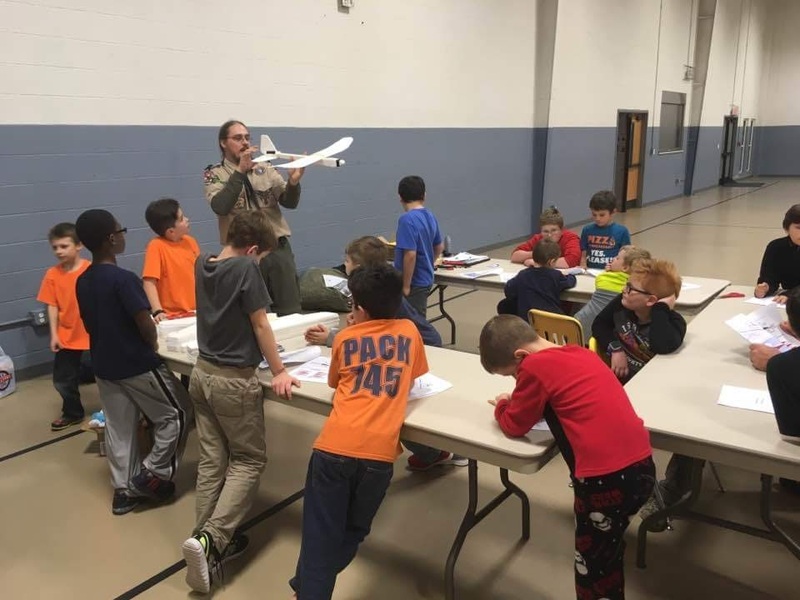 Keep up the good work with all those future Eagle Scout Pilots. I have a whole year to get ready for next year. This is awesome! I'm wanting to do something very similar to this as a summer activity for my scout pack. Thank you for sharing this. Thank you MyTmou5: I'm putting an article together that will be similar but focused on the prep and takeaways. Is there something you'd like to know more of, to incude? Wow Awesome job putting this together. Sounds like everyone learned AND had fun doing the events you had put together. Why wait til next year though? Maybe do a quarterly thing. That gives you three months to plan for the next one and by doing that you can have the kids pick up some of the items used before each one to distribute the cost. Stem only works if its a regular thing that gets incorporated into as many aspects of real life as possible. Maybe do something like cereal box hover craft that are rubber band powered. Boxes will be plentiful rubber bands are cheap as are some versions of props. Like the bag of raycorp props I have here that are useless for anything with a motor but may be perfect for rubber band power. or even pencil copters. Id gladly send them your way for projects. The article is similar and cover more on the event as a whole. (still focusing on the Foam Board Flyer. We incorporate STEM into scouting where I lead as a before and after thing to nearly all activities the scouts do. I want to change it up to have an A and B STEM-night curriculum. This time in want to incorporate something Simple, but Rubber band powered. Video from the stem event overt the summer, as I ready for the next one this February. See, I'd love to do something like this for kids, but as a male who doesn't have kids, I get looked at with.."that look". And, I feel kinda hinky with the Scouting groups here, because so many of them are tied in with youth church groups, and they want a churchgoer involved, not an agnostic who feels funny about organized religion (it's me; I know that. I don't care if you're religious, I just don't have the same beliefs as everyone else, and so I'd rather not get pulled in on a discussion with kids or feel like an outsider because I don't believe the same as everyone else). This is why I like getting involved with Maker Faires, because most of those are groups of people just getting together to show off their groups of talents, with all sorts of different interests...You have people who kinda specialize in a particular field - robotics sports teams, Raspberry Pi programming, aeronautics, cosplay/costume design, and more - that get together to show people and get an interest involved in their field. It's not just about a kid group, either - all ages of Makers are drawn in, which is what I like. Well you have a ton here... Not the same as those in person, but it is a great place to throw these ideas around.